Attributes aren't just useful for storing data and outputting it in certain situations; they can also enable objects to be searched in custom ways. Any attribute type added to a particular object can make that object searchable by that attribute – the developer just needs to put some effort into creating the search interface, implementing the item list filtering, and storing the proper data to make that searching possible. Let's make our Property Location attribute searchable. This should be fairly self-explanatory: we are creating a single field of an integer type. That means we're going to store integer values in this field. The standard behavior of the concrete5 attribute indexer creates these columns starting with ak_, and then continuing with the handle. So if we create a page attribute key with the handle "property_location" the column "ak_property_location" will be created on the CollectionSearchIndexAttributes table, and it will be an integer type. By returning an integer, we know that the proper data type will be inserted into our index field. Let's take a look at this in action. When we save location ID 2 against page ID, this is what it looks like in the database. Looks like everything is set up correctly. Next, we'll want to create a search interface. If we don't create a custom search interface, our default form.php will be used – and this won't be useful because we're not going to enable searching via our custom label (since it's really only for display) - just for our property location ID. So create a file named search.php in the attributes/property_location folder and place these contents into it. Next, let's implement the backend searching. Create a searchForm() method in the controller. This is run whenever an item list is filtered by an attribute key of this particular type. The $list object is the item list object that is being searched, like an Concrete\Core\Search\ItemList\Database\AttributedItemList. This will search our attribute search index table's proper column by the propertyLocationID that we have saved in the request. And that'll do it. We've made our attribute searchable. Next, make sure that the searchForm() method searches those appropriately. Attribute keys can also opt into being included in the keyword index. This doesn't actually take the content of the attribute keys and place them in a separate index, it just ensures that the searchKeywords method will be run on each appropriate attribute type every time a keyword index is performed. $keywords is the text string that is being searched, and $queryBuilder corresponds to the Doctrine\DBAL\Query\QueryBuilder object that is currently being constructed for the current item list query. Now the searchKeywords method should use the currently joined index attributes table to do some keyword-based searches, using the $keywords. Here's how the Address attribute searches all associated address data for the passed $keywords. First, it constructs an OR query expression, and adds multiple LIKE expressions for addresses, city, state, postal code and country. In this example $keywords isn't actually used, because a bound parameter :keywords is used instead. 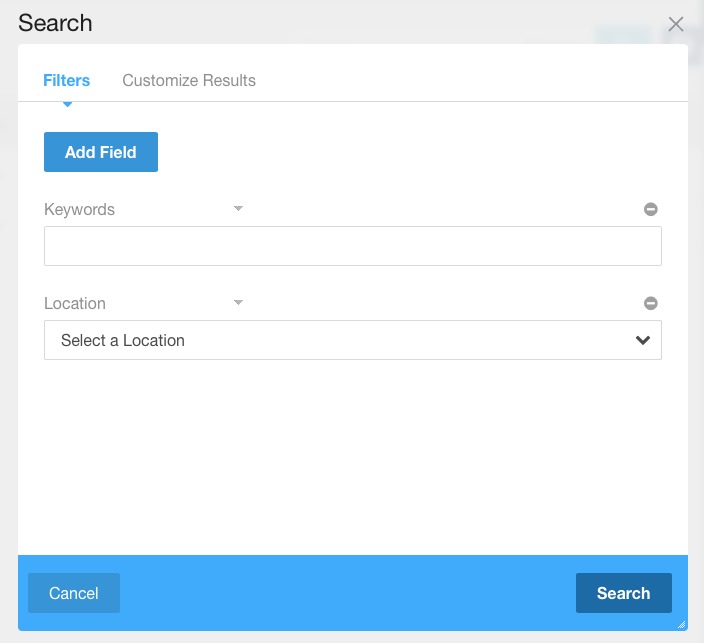 In a keyword search, :keywords is automatically available for the query builder to use.